Results of daily, weekly, monthly, and annual contests are now searchable. In July we introduced the concepts of Points and Competitions. Starting this week, TypeRacers can find historical competition results in Pit Stop, under the newly-created “Competition” tab. Congrats to this month’s champions erikjscott (TRData), bblaise (TRData) jlachney (TRData), playscrabble (TRData), and vixt (TRData). The full list of the top-100 point earners in July is below. To congratulate our first monthly champion, we’re offering erikjscott a $15 prize. Congrats Erik and thanks for racing TypeRacer! For more TypeRacer statistics, remember to check out the third party TypeRacer stats center TRData.com to see how many different TypeRacer texts you’ve typed, check the difficulty of different texts, and track your improvement in even more detail. [7/14 Update] We didn’t realize the current record had been captured on video — added it below! 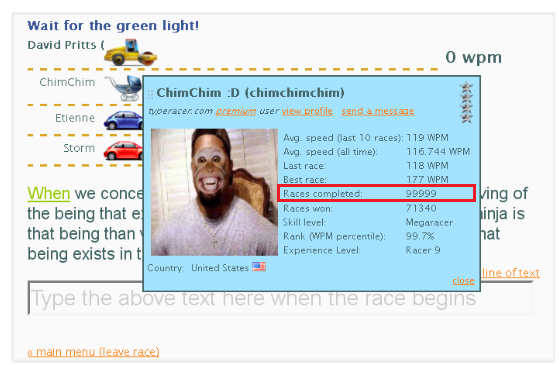 Replay of the 295wpm site-wide record — try to beat it in Ghost racing mode! Here’s a video which includes a keyboard/finger view. Don’t blink – it’s blazing fast and over in a second! Moving into history mode, this race is one in a history of progressively-astonishing speed records on TypeRacer. The table below shows all of the individual, single race speed records from the first day that TypeRacer began recording users’ race history in 2008, and we’ve illustrated the data with various charts. Various observations, as well as notes on how the data has been collected, are below. If you’re interested in TypeRacer-related data, you might enjoy TypeRacerData.com, a third-party database — hosted by former speed champion Noah (licahfox) — which offers extensive TypeRacer statistics. The individual site-wide speed records across the history of TypeRacer, excluding early races by staff during testing and the first few days back in 2008 — with a linear trendline. We’ve excluded staff from the above chart to improve readability, as well as eliminate the unfairness of these early records; some of these records were from internal testing during the days before account creation and race saving were publicly available. If we put these scores back in, the progression of TypeRacer records becomes a bit more messy. The comprehensive history of TypeRacer speed records, including by staff, with a linear trendline. Clicking any of the charts above will take you to the TypeRacer Site Speed Records spreadsheet on Google Drive, where you can download and tinker with the data and charts if you’re so inclined. Sean Wrona (arenasnow2) held the longest record (255.56 wpm) which was unbeaten for 3 years and 7 months. Noah’s 212wpm record represented the greatest single increase to the site record — beating the previous record (also held by him) by 42wpm. TypeRacer staff Alex (TypeRacer) and myself – David (valikor) – hold the largest number of individual records. Of course, we had an entirely unfair advantage using the site before it was publicly released. New features released in the past year – such as the ability to watch replays and ghost race against any user’s races – has given TypeRacers greater control over which texts they’re typing, enabling them to select select any easy quote at will, contributing to an upsurge in record breaking in the past year. For 7+ years, TypeRacer all-site records were held exclusively by male typists, but in the past 2 years there’s been a surge of elite female typists — Kelly (kellysgreens) and Kathy (florentine) — who now hold 4 out of the last 6 speed records. Good work ladies! A few notes are below, and will help some answer frequently-asked questions from anyone who digs into the data. Records from typists who were later banned for cheating are excluded, as are a small number of other records deemed illegitimate for a variety of reasons. All data is from typists using keyboards. Records achieved by typists using stenography are excluded for fairness. If we included these, the current champion would be Ted (stedno) who typed 346wpm (replay) using Plover Steno. Good job Ted! Replay scores may not perfectly match recorded scores because it takes a fraction of a second for your browser to communicate with TypeRacer servers that you’ve completed the race. The impact is generally negligible but may be larger when extremely fast typists type the short, easier texts designed for beginners–a technique often employed for record breaking. This can be accomplished by joining a private race track hosted by a slower typist, or racing against the ghost of a slower typist. TypeRacer does not encourage this but nonetheless considers all records achieved in this manner to be legitimate. Thanks to Sean Wrona (arenasnow), who first compiled the raw data. We hope these records can inspire everyone on the site to continue improving their typing speed, and hopefully we’ll see more record breaking soon! TypeRacer adds a thousand quotes from classic literature and films – reaches 2,000+ quotes total! Reading this old Reddit thread, and seeing the following comment, got me thinking. After reading this, I realized that an announcement about our progress on adding new, richer texts is long overdue. So, without further ado. . .
We’re starting to build up a regular cadence for adding new quotes. As of January 14 2017, we are at 2,058 quotes in the main universe, play.typeracer.com ! Of those, a total of ~1,500 new quotes have been added since Sep. 2016. Typeracer’s quote environment is the broadest, and freshest, it’s ever been. If you’ve been racing much recently, you’ll have noticed the new quotes. Our newest batch has includes a selection of user submissions; as a reminder, you can always submit your favorite quotes using the “Contribute” link at the bottom of TypeRacer . (We will review it only if the submission is complete.) Thanks to everyone who has been submitting! Everyone has a part in defining what Typeracer becomes by submitting their favorite quotes, so if you have any ideas, be sure to submit them. We also added both quotes from Donald Trump and Hillary Clinton’s books (we kept it to 2 quotes per candidate!). I hope you enjoy all of these new quotes as much as I have. For me it’s been a learning experience being exposed to many of these classic works for the first time during a race. Does exposure to texts through a typing game translate into any kind of comprehension, spark any interest, or create any other value? I’ll leave that to the community to decide, but I’m optimistic, and look forward to hearing what everyone has to say. On the competitive side of things, the freshness of quotes has made the high scores on individual texts more accessible than they’ve been in years. Typeracer’s fastest typists haven’t been able to race on many of the new quotes, and some quotes have barely been raced at all. It’s fun to be among the first people to type a new quote, and as an added bonus, anyone who completes these quotes is bound to get on the high scores list for that quote. There are a lot of folks we need to thank for their contributions in helping us passing the 2,000 mark – you know who you are and thank you for everything. In particular, I’d like to thank Sean Wrona (arenasnow) who has given us much inspiration in terms of our vision for our texts. As a quick tip, you can track your progress in the quotes (i.e., how many of Typeracer’s total quotes you’ve completed at least 1 race on) with the “texts” metric on http://www.typeracerdata.com/leaders. It’s a fun way to track your progress, and you’ll know that as long as you’re racing, you’re making progress. Anyone interested in helping us add more texts to Typeracer (selecting sources, entering texts into the system, reviewing texts, etc. ), please email me david@typeracer.com or message me on your favorite typing game site. We’d love to work with you. Hope you enjoy the new texts, and know that we have a lot more coming in 2017. Let us know what kinds of quotes you want. Leave a comment on the blog, or stop by to discuss with us in the unofficial Typeracer Discord channel. Hi All – Happy belated New Year! On behalf of Typeracer I’d like to introduce our first (but hopefully not last) guest author on this blog. Noah (licahfox) is an old-timer on the site, and truly a top-rate typist. Back in Aug. 2008, the first month that Typeracer supported user accounts, and thus the beginning of all our data, Noah was the #1 typist, with an average of 160 wpm during that month. He also had the highest single score (213 wpm), a huge 50-60wpm higher than his next competitor. I recall being one of the best racers myself (my 128 wpm average put me in 6th place in this timeframe, and I was the second most winning typist (982 wins) — second only to Bob Bongloaded (bob_bongloaded), who had an impressive 2,000+ wins! Noah was always able to beat me, but at least with his being a professional organist, I was okay with that! In any case, later in the post we’re going to introduce a new exciting feature. The dedication of Typeracer’s fan base over the years has been inspiring to me, and the fact that we have a chance to collaborate with an old Typeracer fan who’s been playing since the beginning is completely ‘yuge, and we’re happy to be working with Noah to introduce this new feature. Let’s consider it Noah’s “Christmas present” to the Typeracer community – a engineering marvel for armchair software engineer Noah “Licahfox”, pulled off in all the spare time that he most certainly does not have. It any case, since this “Christmas Present”, a new Typeracer contest format, is based on the Typeracerdata.com platform, we thought we’d announce Noah’s main TRData website here on our blog at the same time. Typeracerdata.com: It’s an awesome website for Typeracer fans and racers trying to track their progress. It’s also motivating, with statistics like “text bests” (the average of a user’s best race on each text). For me personally, this lets me view every race as an opportunity to beat my record on the individual text–regardless of how hard or easy it is–and effortlessly track my progress. This might help keep Typeracer fresh for some people. The rankings on the site are unofficial, since the database is incomplete by nature, but at least for the fastest typists, the data is largely complete and should be pretty accurate. And, the more the site is used, the more complete the data becomes! Here’s to 2017, and I shall pass you over to Noah. Anyone else interested in guest authoring can email me at david@typeracer.com, or message me on Typeracer. Thanks! We’ve launched a new competition called TypeRacer Championship 2017! Each month, the Championship Universe will contain a small number of texts, on which top typists will compete to see who can achieve the highest overall score; We award prizes to those who rise to the top, both for the monthly competitions and also for the overall winners of 2017. Many racers have already enrolled in the first Championship round, which began earlier this month. Whether you want to compete for a prize, or simply see how far you can climb up the rankings, we encourage you to participate this month in TypeRacer Championship 2017! As most of you know, the TypeRacer home page sports a “high scores” board to honor the fastest typists of the hour, as well as the top-100 in terms of overall average speed, races completed, and recent average, but there’s no comprehensive scoreboard to showcase the “overall” TypeRacer MVPs (herein referred to as “Most Valuable Racers”, or MVR). As an experiment, we defined the following formula to award points for both dedication and raw typing speed: TypeRacer MVR Points = Typing_Speed x Words_Typed. We crunched the data from the past 2 years; the full list is below, and we’d like to offer a special “congratulations” to lucean, WordRacer888, tesla_diesel, jessegarcia, pentalon, shoaib_shahnawaz, maximumchris2, kevinski1, and mokori! These folks are the best overall typists from the past 2 years! followed by other large, English-speaking countries (UK, Australia, Philippines). Indonesia, Sweden, Japan, and Germany also made it into the top-10, earning high point scores, and being the leaders among non-English speaking countries. Looking at pure speed, a few unexpected candidates came up as the “fastest countries”: Vatican City at 86wpm, North Korea at 85wpm, and Antarctica (82wpm). (Wait, what?) A small number of folks who set (probably) fake countries such as Antarctica skewed this data. We’ve made manual updates to a few of the countries to show the countries different racers really represent. Is this data valuable or interesting? Any thoughts or suggestions? Should we add a new “overall typists” scoreboard to TypeRacer? Should the lists be longer than 100, or maybe it should be calculated and published at the end of each month? Let us know in the comments, and see you on the track! Anybody who’s been on Typeracer for a while will know that the site is a platform for people all around the world to motivate each other to improve their typing speed through friendly competition. I’ve always enjoyed racing against typists from so many different countries, and in my years playing Typeracer, I’ve gotten to know interesting typists from all over. I’ve made friends with the man once called the fastest French typist in the world (motsak), and had opportunities to talk to the infamous self-proclaimed fastest typist in Italy (mattbovino) as well as Brazilian typing legend Guilherme Sandrini/Kukkain (kfzx). All of these guys have been nice enough to give me an experience that I usually don’t have: the experience of losing races, over and over again. Thinking about this great group of folks, and the diversity they represent, I started wondering which countries our users are actually coming from, and how they compare on the racetrack. Rather than anecdotal approximations, I decided to get all the data from 2014. Or, to be more specific, I should say that I made Typeracer founder Alex Ephsteyn download millions of races of data from our servers, and then sort, filter, and organize them for me so that I could write this blog post! Take a look at the lists below (full raw data available here). Note that this data is based only on races finished by registered users, not guests. But what about speed? Which country had the fastest typists? * not counting countries with less than 800 users. How do typists from the Netherlands and Singapore type so fast? Or are the folks from these countries who use Typeracer not a representative sample for some reason? We’re not sure, but anyway, we hope to see you on the racetrack soon, representing your country!